AFC Fylde manager Dave Challinor is already looking forward to leading out his team at Wembley in the FA Trophy final. The Coasters will meet Leyton Orient in the final on Sunday, May 19 after a breathless 3-2 aggregate win against Stockport County. “For me to walk my team out at Wembley will be the biggest honour I’ve had in my management career,” said an emotional Challinor. 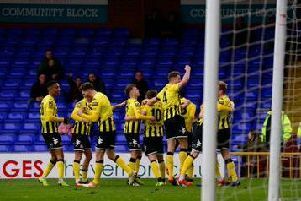 After a goalless draw in the first leg at Mill Farm, Challinor said he expected a more open return at Edgeley Park – and that’s exactly what he got. 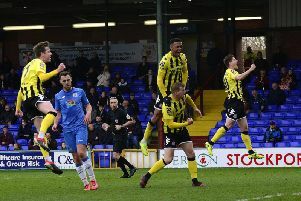 County opened the scoring through Nyal Bell’s 25th minute goal before Danny Rowe put AFC Fylde on level terms from the spot midway through the second half. Then, with extra-time looming, Ryan Croasdale put the Coasters ahead on 85 minutes. However, Ash Palmer hauled the Hatters on level terms, only for Alex Reid to book a Wembley date almost from the restart in front of a crowd of 6,064 with 538 Fylde supporters present. Challinor said: “Good to see so many fans, and I can guarantee, whether it’s wives, girlfriends, siblings, whoever it may be, to go and see them perform at the greatest stadium in the world is a brilliant experience. “I thought we were fantastic and that we dominated the game territorially. “We were done on the counter which was poor from our perspective, but we just needed to be patient. Orient booked their place in the final after a 2-1 win in their second leg at AFC Telford United. Having led 1-0 from the first leg, Orient doubled that lead through Matt Harrold’s early goal. Although Ellis Deeney scored for Telford just before half-time, Orient secured a 3-1 aggregate win through Josh Coulson’s goal 13 minutes from full-time.